What is the Neurosequential Model of Therapeutics©? Who Is Helped by the NMT™? Families and providers who feel frustrated by the persistence of troubling behavior despite continuous effort and services. Youth who have experienced multiple early traumas in life that include neglect, abuse, exposure to substance abuse or domestic violence, or disruption in their caregiving in the first 5 years of life. How Does the NMT™ Help? A key part of the NMT™ is education about how the brain works – in particular the “Sequence” in which the brain develops – which informs the sequence in which treatment should follow in order to be effective. NMT™ works to figure out what kinds of activities will be most helpful for building capacity in each of the above 4 areas of the brain and then builds a plan to increase these activities in daily life. To Learn More about the NMT™ Approach, Please see the videos below where Dr. Bruce Perry describes several key NMT™ concepts in brief (10 min) teaching sessions. $800 for all sessions / services up to and including the 30 day follow up consultation. Stephen Bradley is an adept, engaging presenter. He makes the NMT concepts, based on Bruce Perry’s work, easy to digest and to put into use. He is adroit at thinking in the moment, employing metaphor, drawing connections between the material, the work with families and “real life, and responding to questions. He easily adjusts to the needs of his audience. Stephen puts the principals of the NMT model to use in the training, and engages participants in useful exercises. I highly recommend Stephen as a trainer. Core Concepts and Application of NMT™ Principles in Practice (Full day / 6.5 hour Workshop). Gain an initial understanding of the role of Relational and Reward Neurobiology in shaping children’s responses to the demands of their environment. Stephen J. Bradley is a Fellow of the Child Trauma Academy and has completed NMT™ Training Certification through the Phase II level. 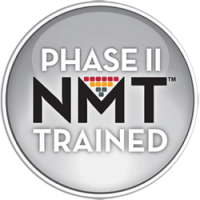 For more information on NMT™ Training Certification and the NMT™ Assessment Process, click here.